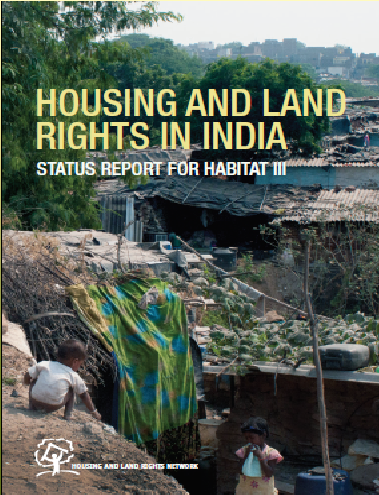 New Delhi—On Friday, Housing and Land Rights Network (HLRN) launched its first Habitat III country report titled, Housing and Land Rights in India: Status Report for Habitat III. The United Nations (UN) Conference on Housing and Sustainable Urban Development (Habitat III)—the third bidecennial international conference on habitat issues—will be held in Quito, Ecuador, in October 2016, to adopt a new Habitat Agenda till the year 2036. The HLRN report for Habitat III, being submitted to the Government of India and the UN, has been endorsed by 56 organizations, social movements, and community groups across the country. It presents an indispensable analysis of India’s implementation of the Habitat Agenda, as states and governments pledged to do upon its adoption at the Habitat II conference in Istanbul in 1996. Applying the core principles and commitments of the Habitat Agenda, the HLRN report documents the status of housing and land rights in the country and highlights relevant law and policy developments over the implementation period. It also provides recommendations to the Indian government for the improvement of housing and living conditions, and to UN-Habitat and organizers for the development of a human rights-based agenda at Habitat III. The report release was followed by a panel discussion on The Right to Housing in India: International Commitments and National Response. Independent experts explored various dimensions of India’s legal commitments to, and violations of, the human right to adequate housing across the country. Some of the recommendations made in the HLRN report include the need for a moratorium on forced evictions; improved state accountability; trial of officials responsible for violations of housing and land rights; implementation of international law, guidelines, and recommendations of UN treaty bodies, Special Procedures, and the Universal Periodic Review of the UN Human Rights Council; better coordination among ministries and national human rights institutions; and recognition by nation states and UN-Habitat of the rural-urban continuum. The HLRN report asserts that the outcome document of the Habitat III conference should adopt a strong human rights approach that integrates the commitments of the Habitat Agenda as well as international law and standards. At the event, HLRN also released a compilation titled United Nations Documents Related to Housing and Land Rights in India. This document is intended to serve as a reference for understanding, monitoring, and reporting on India’s compliance with international law and guidelines, and recommendations of UN bodies and mechanisms.